Easily track sales using any ecommerce platform. Refersion integrates seamlessly with the most popular platforms, or use our secure API for any website. Use Refersion’s Magento plugin to track orders and attribute commissions to your promoters for your Magento store. Every Refersion account comes with API keys and instructions for custom integrations with your platform. 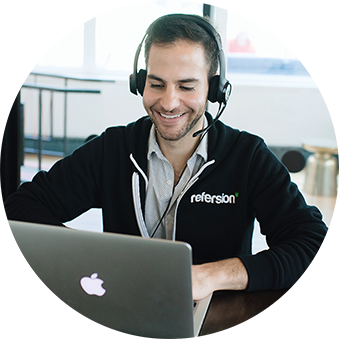 Install the Refersion Shopify App to create a referral or affiliate program for your Shopify store in minutes (literally). Refersion leverages exclusive APIs to build custom integrations and features for Merchants on Shopify Plus. We have a plan for your business. For custom Enterprise integration support or help sorting our which solution are best for your business contact us. My platform isn’t listed, can I still use Refersion? Many merchants have successfully integrated us to other platforms and solutions using our API and tracking documentation. We’d be happy to troubleshoot with you and your developer if you decide run your own integration. Does Refersion integrate with Zapier, Automate or other API automation service? We don’t currently have any pre-built functions or integrations built out. However, we’ve helped merchants set this up in the past using our API Documentation. Please give it a try. We’re here to help if you run into any issues while trying to enable the flow. How much does integration or setup cost? Self-directed integrations are always free and our team is available to help answer any questions. Have a completely custom integration? Get in touch! Our team can help think through the approach and issue proposals as needed. I’d like to partner with Refersion to enable an integration, how do we start? Awesome! We love working with new partners. Please reach via our contact form and we’ll schedule a call to discuss. Thanks in advance!